I hear that you've had some worries about me. I understand. Your world is a very uncertain place right now. And when it comes to money, it looks as though your leaders don't understand some basic monetary principles, making things even more unsettling. But I want you to know that the problems you're experiencing are actually nothing new. I've seen these monetary, fiscal, and economic difficulties many times before. And I can tell you this: you're safe with me. That's a bold proclamation, but I've provided monetary protection numerous times throughout history – too many to count, in fact. I've served all kinds of people over the centuries, from kings and counts to serfs and servants. To put your mind at ease, let's review my core characteristics, along with some history, to show how I can protect you against the monetary danger that's likely to worsen in your near future. We'll also take a look at your peculiar set of circumstances to see how I can be of service. By the time we're done, I think you'll feel much better about my ability to help your portfolio withstand whatever is thrown its way. I am internationally accepted, last for thousands of years, and probably most important, you can't make any more of me. You've heard that statement before – but do you know what it really means? Money is a medium of exchange and a store of value. Almost anything can be used as money, but obviously some things work better than others. It's hard to exchange things people don't want and other things don't store value well. Over thousands of years, I have emerged as the best form of money (along with silver). The paper dollars in your wallet are technically a currency, not real money. In other words, they are a government substitute for money. The man you call Aristotle best defined the primary reasons why I'm considered money: a good form of money must be durable, divisible, consistent, convenient, and have value in and of itself. It must be durable because you can't have your money disintegrating in your pocket or bank. That's why you don't use wheat; it can rot or be eaten by insects. It must be divisible, which is why you don't use diamonds or artwork; they can't be split into pieces without destroying the value of the whole. The lack of consistency is why you can't use real estate. One piece is always different from another piece. It must be convenient, which is why you don't use other metals like lead. The coins would have to be too big to handle easily to be of sufficient value. It must have value in and of itself. This is why you shouldn't use paper as money. And one more thing: I can't be created out of thin air. Not even the kings and emperors who clipped and diluted gold coins used paper as money. Aristotle didn't include this in his list, but it's vital. So you see, there's no superstition here. It's simply common sense. I am particularly good for use as money, just as aluminum is good for making aircraft, steel is good for the structures of buildings, uranium is good for fueling nuclear power plants, and paper is good for making books. If you try to make airplanes out of lead or money out of paper, you're in for a crash. And by the way, don't fret about those who say I'm not as good an asset as an income-producing vehicle. They misunderstand my role. I'm not trying to be a stock, for example. My function is as money and a store of value, so the proper comparison is to your dollars, or what you call Treasury Bills (of similar nominal value). And here is where I excel and serve my purpose: since 1913, the US dollar has lost 96% of its purchasing power. I have lost none. Remember, I am the only financial asset that is not simultaneously someone else's liability. I don't require the backing of any bank or government. Because I am eons old, I've observed something throughout history that you may not be aware of: government fiat currencies are a relatively new invention, and none has endured. Eventually, they have all failed. Me? I've never been defaulted on or worth zero. Remember this the next time you have any doubts about my long-term worth. During the time of Christ, an ounce of me purchased a Roman citizen his toga (suit), a leather belt, and a pair of sandals. Today, one ounce will still buy a good suit, a leather belt, and a pair of shoes. In 400 BC, during the reign of King Nebuchadnezzar, some scholars reported that an ounce of me bought 350 loaves of bread. Today, an ounce still buys about 350 loaves ($1,700 divided by 350 = $4.85/loaf). In 1979, my average price was $306.68. This bought an average-priced full-size bed. Thirty-three years later, $1,700 would still buy you a nice full-size bed (and then some). You can rest assured that over time, I will hold my value. And when you near the end of your life, you can pass me on to your loved ones, knowing full well they will have something that cannot be devalued, debased, or destroyed. Like you, I'm concerned about the current state of fiscal and monetary affairs. It seems your government leaders have boxed themselves into a corner. They've incurred too much debt and are spending too much money. It's important that you understand some lessons from history about this kind of behavior so that you're certain of what I can do for you. Morgan Stanley reported that there is "no historical precedent" for an economy that exceeds a 250% debt-to-GDP ratio without experiencing some sort of financial crisis or high inflation. US total debt currently exceeds GDP by roughly 400%. Detailed studies of government debt levels over the past 100 years show that debts have never been repaid (in original currency units) when they exceed 80% of GDP. US government debt will exceed 100% of GDP this year. Investment legend Marc Faber reports that once a country's payments on debt exceed 30% of tax revenue, the currency is "done for." By some estimates, the US will hit that ratio this year. Peter Bernholz, a leading expert on hyperinflation, states unequivocally that "hyperinflation is caused by government budget deficits." Next year's US budget deficit is projected to be $1.3 trillion. The solution many of your leaders are pursuing is to create more currency units. Here's an updated picture of the increase in the US monetary base vs. my rise in price since 2008, when your problems starting surfacing. 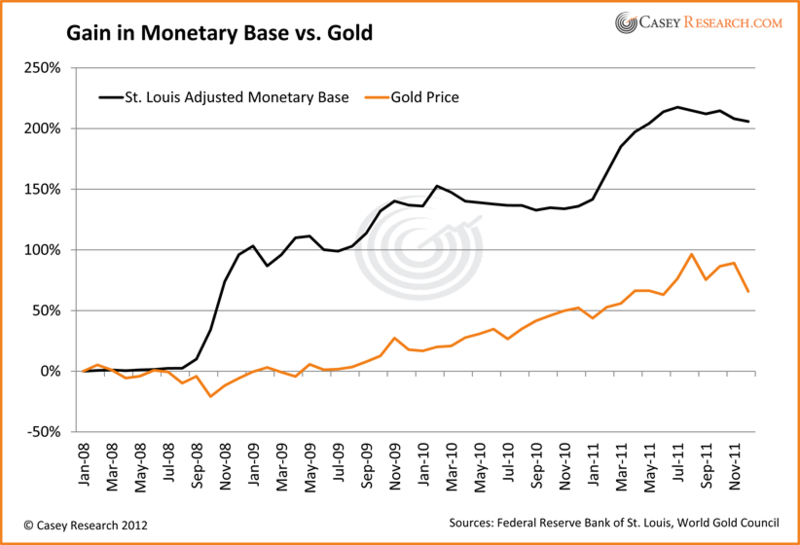 The monetary base has grown 205.8%, while my price is up 65.8%. This alone implies that my price in dollars is likely to climb much higher. This is also the reason why I'm not in a bubble, as some have tried to claim. It is your central banks and bond markets that are in a bubble. The fact that my price is rising is a warning that what your leaders are doing is unsustainable and potentially dangerous to your currency. Think about this: the US has debt backed by debt, based on debt, dependent on debt, and leveraged with debt. You can, for example, buy a bond (i.e., lend money) on margin (i.e., with borrowed money). This is not a sound way to run financial markets. Moody's cautioned that it may cut the triple-A status of France, Austria, and the UK; and it downgraded six other European nations including Italy, Spain, and Portugal. Standard & Poor's cut the triple-A status of France and Austria, while Italy, Spain, Portugal, Cyprus, Malta, Slovakia, and Slovenia were downgraded. Fitch downgraded Belgium, Cyprus, Italy, Slovenia, and Spain, and stated there was a 50% chance of further cuts in the next two years. Standard & Poor's downgraded 34 of Italy's 37 banks. Moody's warned just last week that it may cut the credit ratings of 17 global financial institutions and 114 European ones. The European crisis is far from over; and the path of least resistance for politicians is to create more currency units. This action can and will have clear and direct consequences: currencies will devalue, and inflation – perhaps hyperinflation – will result. Once again, I encourage you to use me to protect some of your wealth. Given the state of your monetary system, you should accumulate me (and silver) on a regular basis. Just buy some every month and put it in a safe place. After what I've witnessed throughout history, and based on the current path your government leaders insist on pursuing, I suggest using me as your savings vehicle instead of putting dollars in a bank. If you don't own enough of me when these fiscal troubles really accelerate, I fear you will regret it. I've warned many in the past about the dilution of nations' currencies, and those who didn't heed my warnings experienced severe financial pain. Excuses won't pay the mortgage nor feed the family when the effects of currency debasement hit your home and pocketbook. Make sure you own enough of me to make a difference to your portfolio. This means having more than a couple coins or a few shares of GLD, the latter of which is only a proxy for my price. … would you feel that you own enough of me? Buy a sufficient amount so that as your currency continues to lose value, your portfolio won't. If you do your part, I promise I'll do mine.